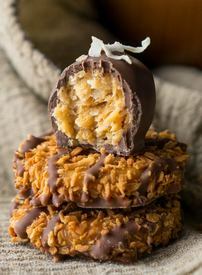 If you love Samoa Girl Scout Cookies, then these easy Samoa Truffles are going to perk up your taste buds!! All the chewy caramel and coconut flavor from a Samoa cookie wrapped up in a thick layer of chocolate! Bonus – it’s only 4 ingredients! !